On Wednesday, September, 13, after two years of unprecedented Olympic campaign, the International Olympic Committee (IOC) will formally nominate Paris (France) as the Host City of the 2024 Summer Games and Los Angeles (United States) as the Host City of the 2028 edition. This dual designation, adopted at the 130th IOC Session in July in Lausanne (Switzerland), has somewhat changed the usually devoted to the Candidate Cities procedure. Thus, the time of the presentations was reduced, as was the composition of the French and American delegations, at the request of the IOC. Between 50 and 60 people should make up the delegations, about half of what had originally been envisaged. It should be noted that with the change of procedure, the IOC has ideally been able to put forward the principles of the Agenda 2020, an ambitious reform calling in particular the reduction of costs for the candidature phase and the valorisation of sustainability for the project. In Lima, the delegation of Paris 2024 will be led by the Mayor of Paris, Anne Hidalgo, and by the co-chairs of the Bid Committee, Bernard Lapasset and Tony Estanguet. Sports Minister Laura Flessel and State Secretary for the Disabled Sophie Cluzel will provide the state’s guarantee, while Valerie Pecresse will represent the Paris Region. Patrick Ollier will be present as President of the Greater Paris Metropole, a territorial entity that fully relies on the organization of the Games – and the Universal Exhibition of 2025 if France obtains the attribution – to affirm its singular status between the City and the Region. Stephane Troussel and Patrick Braouezec will represent the Department of Seine-Saint-Denis and Plaine Commune. Dominique Tian, for his part, will represent the City of Marseille because of his functions as First Deputy Mayor of the second city of France. Jean-François Martins, Deputy Mayor of Paris in charge of sports and tourism will also be present in Lima. Political unity, an important asset throughout the Olympic campaign, will be embodied by the presence of three former Sports Ministers : Jean-François Lamour (under the presidency of Jacques Chirac), David Douillet (under the presidency of Nicolas Sarkozy) and Valerie Fourneyron (under the presidency of François Hollande). As a member of the IOC for France, Guy Drut will also be present in the Peruvian capital, as will Denis Masseglia with his cap of President of the French National Olympic and Sports Committee (CNOSF) and Emmanuelle Assmann as President of French Paralympic and Sports Committee (CPSF). Other personalities of the candidature tricolor will also be of the travel : Etienne Thobois, CEO of Paris 2024 ; Jean-Philippe Gatien, Director of Sports ; but also Marie Barsacq, Director of Heritage. 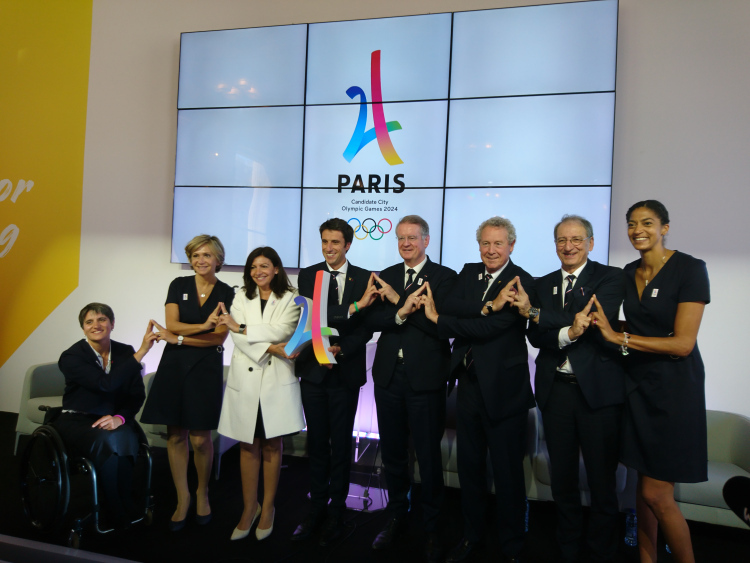 In addition to the institutional representatives, Paris 2024 will also be represented by Tegla Loroupe, Head of Mission of the Refugee Team at the Rio 2016 Games ; Alain Ducasse, famous Michelin-starred chef ; Laurent Petrynka, President of the International School Sport Federation ; and number of French athletes, Olympians and Paralympians, including Teddy Riner, Marie-Jose Perec, Sarah Ourahmoune, Stephane Diagana, David Smétanine Cyril More, Brice Guyart, Arnaud Assoumani, Michael Jeremiasz, Ryadh Sallem, Fabien Gilot, or Gwladys Epangue. Concerning the stay in Lima, the bids and the IOC will answer a specific program. As was the case during the presentation of the projects in Doha (Qatar) in November 2016, educational outings are announced in the presence of athletes ambassadors until Wednesday and the final presentation. For this important event – even if the stakes of a duel are now obsolete – the IOC has developed a staggering pattern similar to all past Olympic elections, with the nuance that the tripartite agreement will eventually lead to ratification at show of hands by the members of the institution. Until now, every recent ballot designed to designate a Host City of the Games – and last minute incident, as was the case for the designation of Beijing 2022 – had taken place by secret ballot through electronic boxes. 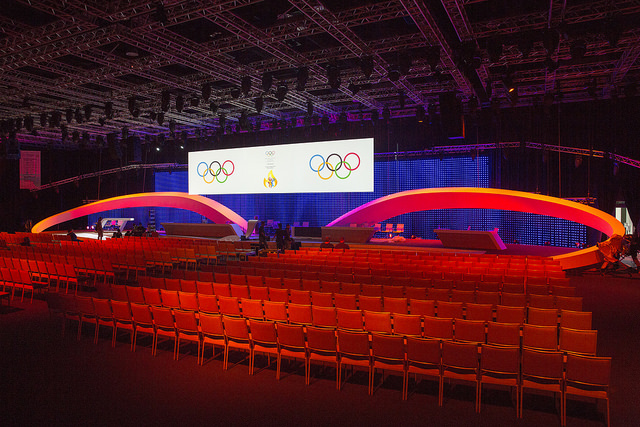 The Lima Convention Center will open its doors at 9:00 am on Wednesday – 4:00 pm in France – before the tripartite agreement between the two Candidate Cities and the IOC is presented at 11:10 am (6:10 pm French time). Then, from 11:30 am to 11:55 am (6:30 to 6:55 pm), the Evaluation Committee for the Olympic Games 2028 – in the composition is identical to that of the Olympic Games 2024 – will mention its Report. The latter will of course only concern Los Angeles, the latter being the only one to have positioned on the 2028 deadline. From 12:00 am (7:00 pm), Paris and Los Angeles will take turns in the rostrum, from 12:00 to 12:30 (7:00 to 7:30 pm) for the « City of Light » and from 12:30 to 13:00 (7:30 to 8:00 pm) for the « City of Angels ». So will come the election time with the approval of the following scheduling : Paris 2024 and Los Angeles 2028. Once the ratification has been completed, the two host cities and the IOC will hold a joint press conference (2:00 pm or 9:00 pm French time) to highlight the organization of the Games and the success of a « win-win-win » to use the formula used by President Thomas Bach in Lausanne. At the same time, celebrations are expected to take place in Paris and Los Angeles. These will symbolize the end of an unprecedented Olympic campaign and will try to demonstrate popular enthusiasm in the absence of the slightest suspense. Things could have been different in the run-up to a classic ballot in which – fiction scenario – Paris would have won the Olympic vote against its competitors after three failures (1992, 2008 and 2012) to taste more or less bitter. On Wednesday evening, the Olympic rings will be unveiled on the Esplanade du Trocadero, just in front of the Eiffel Tower. This presentation, orchestrated at 8:05 pm by Bruno Julliard, First Deputy Mayor of Paris, will precede forty-eight hours a popular concert in front of the City Hall. The concert, broadcast live by the C8 channel and the RFM radio, will conclude the Parisian celebration. The French capital, however, will not be the only French city to celebrate the Olympic Games 2024. Indeed, Marseille will also be celebrating on September 13. In a statement released Friday, the Phocean City – which will host the sailing events and part of the football tournament – has announced enlightenment Olympic colors of various landmarks of the city since 8:30 pm, including the Velodrome Stadium. The City Hall – where the Mayor, Jean-Claude Gaudin, and the President of the French Sailing Federation, Nicolas Henard, will attend the official IOC announcement – will also be flaunted with Olympic colors, while a barge will be installed in the Old Port to celebrate Paris 2024. After these moments of celebration, the serious things will begin – or rather will continue – really. The constitution of the Organizing Committee will be one of the major projects for the next six months. If the City of Paris is to be a key player in the process, the State should take up its role with the investment of the President of the Republic who will undoubtedly seek to influence the composition of the future OCOG by placing personalities confidence or by ensuring the various strategic choices. But the instigators of the project – at the various levels of decision-making – will have to be careful not to disperse and not to take an excessive advantage of the allocation of the Games. If the composition puzzle of the Organizing Committee will be an element to be scrutinized in the coming months, the role and the remarks of the various institutional actors after September 13 will also have to be studied. Thus, a war of the egos is not to be discarded in view of the structuring of the OCOG and the launching of the first projects. Nevertheless, such an undertaking would inevitably send a disastrous image to public opinion. The practical implementation of the project will make it possible to become aware of the scope of the task to be accomplished by the summer of 2024 and even before. Of course, the Paris 2024 project only mentions two sports venues to be built (Aquatic Center and Bercy Arena II) – one of which is independent of the Games (Bercy Arena II) – but the facilities of the Athletes’ Village will have their organizational preparations, in particular on the budgetary level. Planned on the territorial perimeter of Pleyel / Île-Saint-Denis, the Olympic and Paralympic Village is a showcase of what Paris 2024 intends to leave as a legacy to the Paris region, in terms of housing, but also in terms of enhancement of existing infrastructure and the preservation of the environment. To achieve the construction of this future eco-neighborhood of 126 acres, earthworks and remediation of the site will certainly be on the agenda for the Organizing Committee, SOLIDEO and private actors who will engage in delivery of the project, not to mention issues related to the burial of high-voltage power lines and developments related to the sound distances from highways. Located two kilometers from the Stade de France and the future Aquatic Center of Saint-Denis, the equipment – which will use the Cité du Cinéma Film Studio to host the athletes’ restaurant – was one of the strong points of the bid for Paris 2024 . It must be said that with the ambition to generate, after the Games – ideally and without technical change – some 2,200 housing units for families, 900 student housing units, as well as 2 hotels and no fewer than 10 hectares of green space , Paris 2024 has clearly wished to demonstrate the importance given by the candidature to the urban regeneration of the department of Seine-Saint-Denis. The development of a Media Village in the « cluster » of Dugny / Le Bourget also responds to this wish, a wish that is expressed in parallel and in symbiosis with the development work of the future Grand Paris Express and new lines of the Parisian metro. 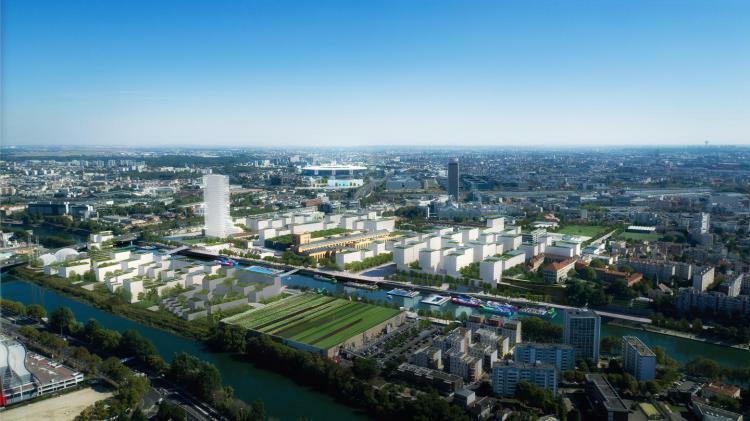 In any case, the will – or should we say, the promise – of the candidature to support the revival of the Seine-Saint-Denis can only take shape on urban actions and embellishment of the territory. Educational problems and the access of the population, especially the younger ones, to sporting activities and to sports facilities (such as the Marville Swimming Pool) or newly constructed facilities (Aquatic Center of Saint-Denis) will again be points crucial features of the Olympic and Paralympic project. Like the 2012 London Games with what has become an emblematic eco-neighborhood of the East End revival, the Paris 2024 Village concept will be a key focus of the Olympic and Paralympic project. Consequently, any problem (delay, additional cost, etc.) relating to the said Village may have repercussions on the whole system and affect the popular perception of the Games. 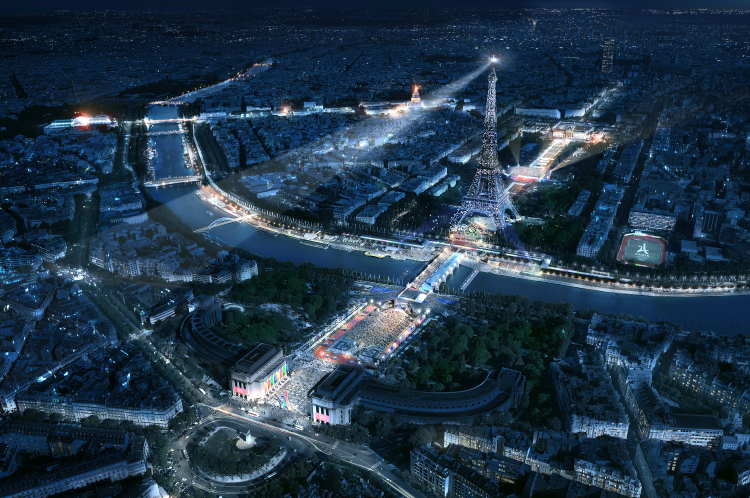 In addition to the perimeter of the Seine-Saint-Denis and beyond budgetary issues, which will particularly concern the security aspect of the event, the Olympic and Paralympic promises will be scrupulously analyzed in its capacity to respond to the challenges of accessibility of sites and transport for people with reduced mobility. In the absence of a regular, frank and massive commitment by the public authorities on this issue for many years, the Paris 2024 project has the ambition to embody a new perspective on disability. 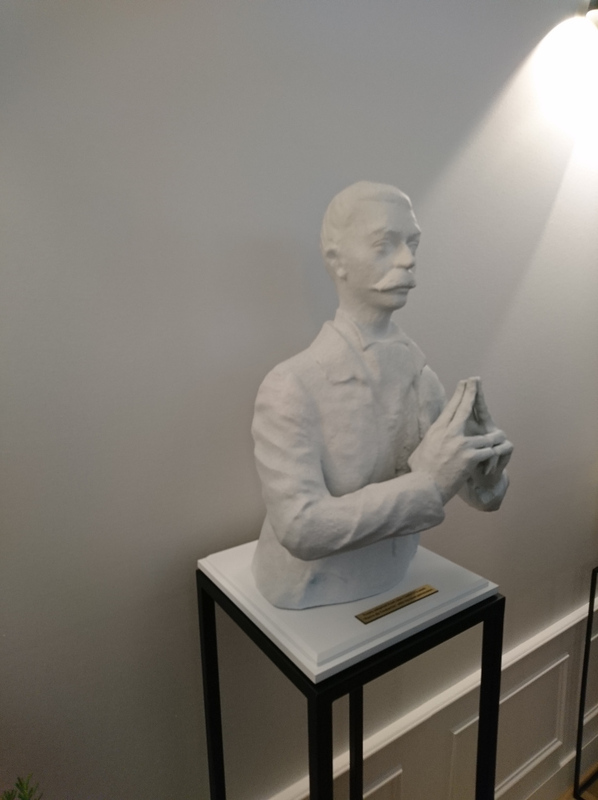 The full integration of the French Paralympic Committee and local and national associative actors may be able to facilitate collective awareness and, ultimately, a long-term vision for disability in all its forms and in its specificities (housing, transport, work, education, health, etc.). Believing that a bid for the Games and the organization of the Games could meet all expectations would be utopian. In the aftermath of September 13, the sometimes lyrical speeches heard during the last two years will have to give way to the gravity of the actions to be undertaken on the ground. It is the credibility of a project whose instigators have repeatedly praised merits and virtuous aspects. The next seven years will be interesting from this point of view to study, especially since other issues will or will inevitably be grafted, first of all the renovation of the governance model of sport in France. This will give rise to further developments in the years to come.